June 6, 1944: The scattered units of the 82nd and 101st Airborne have taken position in the most famous village in Normandy to have been liberated by American paratroopers. Relive this battle, which John Steele was able to watch from the tall spire of the Sainte-Mere-Eglise church, suspended from his parachute, feet dangling in the air. From the Drop Zones to the resistance at La Fiere manor, lead your paratroopers to victory! 101st Inf. Div. 502nd inf. reg. (UK Paratroopers - Rifle Squad) and its recruitment options. Rules for night combats, street lamps, sleeping units, dominant position and large buildings, gliders, etc. 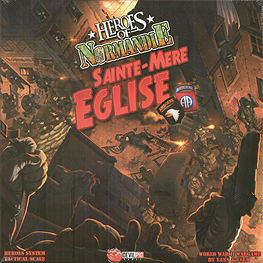 You must have the Heroes of Normandie base game in order to use this Scenario Pack.